I don't want to jinx myself, but I've somehow managed to stay cold/flu free this entire school year, which is a first. I've been teaching now for more than a decade and every year it's the same thing: I get sick first semester and then yet again second semester, almost like clockwork. (In a week I'll probably be telling you about how I've been stricken by a nasty cold, but I have my fingers crossed and my trusty Echinacea handy.) Unfortunately, my students are in constant fits of sneezing, sniffling and coughing and some of my family members haven't been as lucky as me. Here in Los Angeles, the fickle weather only adds to the conditions that allow sickness to blossom in its unsuspecting victims. It's 90 degrees and sunny one day and 60 degrees and raining the next. In fact, yesterday, when these pictures were taken, all of the aforementioned conditions were rolled into one day. In the morning it was overcast, raining and cold. 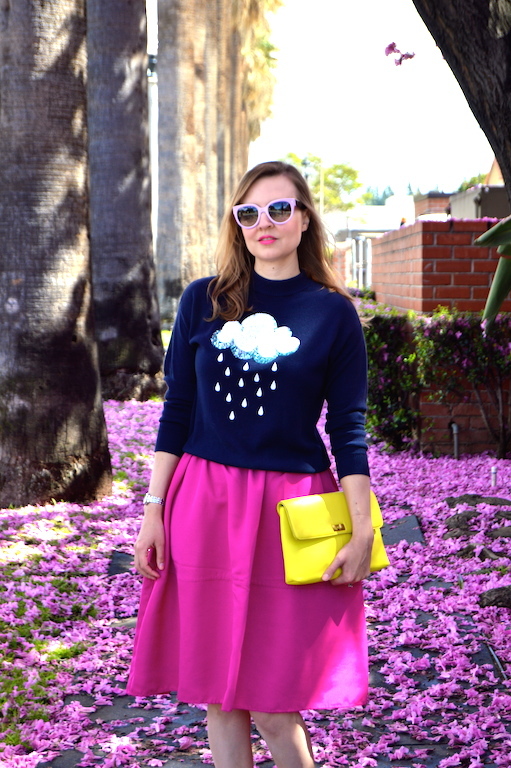 As a result, I thought it was the perfect opportunity to wear this sequined rain cloud sweater from H&M. However, once I got dressed it was suddenly sunny and warm. When my husband and I returned from lunch a couple hours later, it had switched back yet again to being overcast with ominous clouds, such as the one on my sweater, looming in the skies. The weather really needs to make up its mind! Well, at least spring is right around the corner and with it hopefully more temperate weather. My favorite thing about spring here in Los Angles are the blossoming trees. I happened across these cherry blossom petals and, much to my husband's chagrin, made him take a whole new set of photos of me in this new, beautiful location. My husband hates cherry blossoms, jacarandas and other blossoming trees because of the destruction they cause to people's cars and property. He is pragmatic and I am just impractical, so I didn't mind getting my shoes all sticky standing amidst these gorgeous pink petals. I'm delighted with the photos! Blossoms in the spring is one of my all time favourite things. The photos are gorgeous. You should be where I am. It is going to be 16 C today and then later in the week will only be 2 C. In case you don't know celsius, 16 is quite nice but you still need a light jacket. 2 is just barely above zero and cold. Ugh don't jinx yourself!! I said the same thing last week. I was boasting about my superhuman immune system and BAM... sick! Anyway, gorgeous look! I would love to spend hours in your closet! I hope your luck continues and you stay healthy! My little one has been sick for the last few days and I'm crossing my fingers I don't get it! 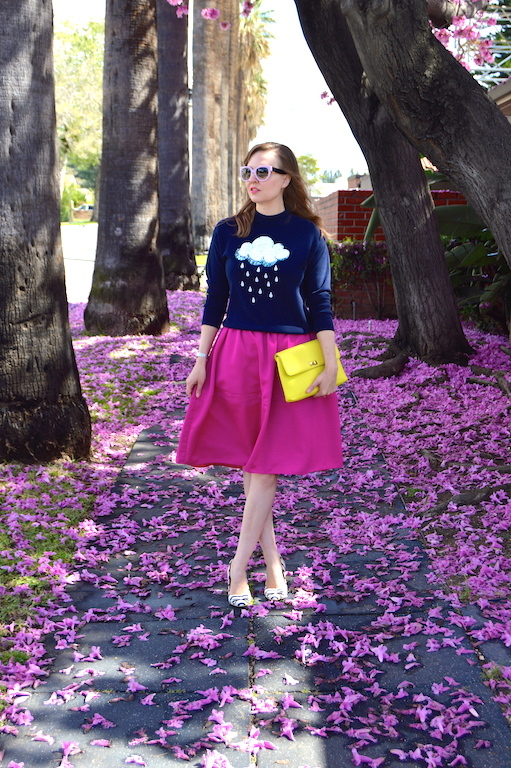 I love that adorable sweater, especially with the pink skirt and cute striped shoes! Such beautiful photos! The background is just lovely, so I am glad you chose to re-take photos. :) Adorable sweater and it looks great with your pretty pink skirt. Now that is one cute sweater! Love it with the colour of the skirt and the stripey shoes. Oh wow! These photos are beautiful! The flower petals are perfect for the colors of your outfit. I love your sweater - too cute. And your skirt and bag are so cheerful! :) I hope you keep healthy the rest of the school year! Aw hope you feel better now! I ended up with the 48 hour flu as I visited my neice who is in kindergarten..:-) I adore this sweater and the vibrant colors you are wearing. I love your mix of colors Katie. This outfit is just so perfect and I agree that this weather is just crazy with the hot and cold. 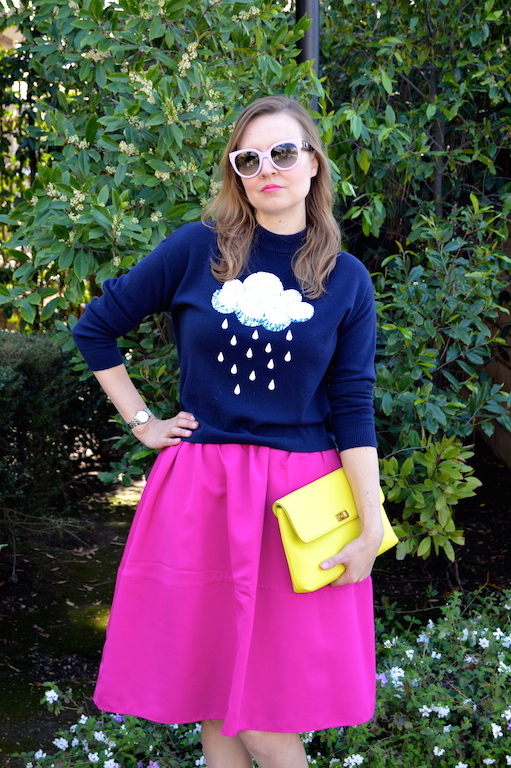 OK, before I even read the post I was gonna comment how I used to have an identical hot pink midi skirt from Express but got rid of it. It is probably this one. Anyhow, your sweater and shoes are gorgeous. Love the clutch too. 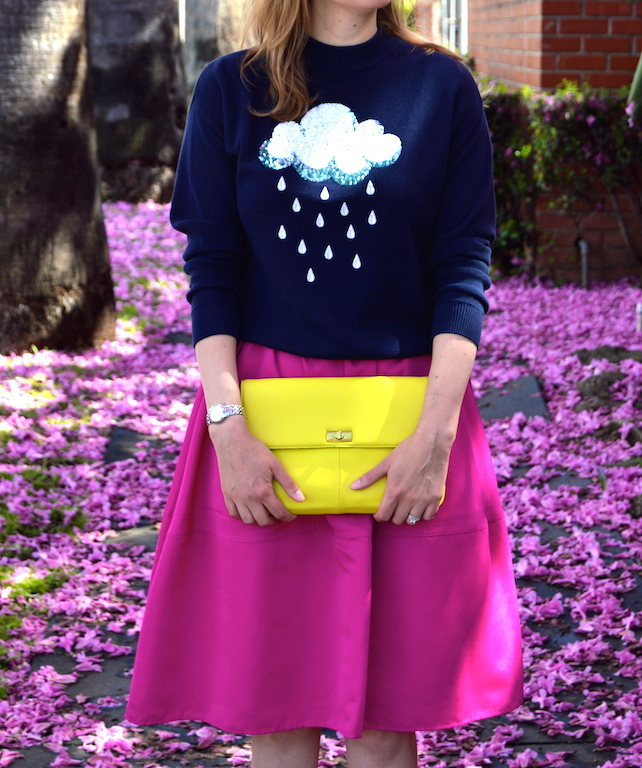 I am carrying a new yellow clutch in my latest post, too. I hope you wrap up the school year not getting sick. And those pink petals are gorgeous, my friend. Oh Katie, totally in love with this look. That sweater is adorable!! I am just in love with all the colors in this! I'm always trying to find colorful shots when I do my blog photos! I also love that your sweater is of a rainy cloud ... sort of a metaphor for being sick. That is the loveliest background and outfit and I love how they go so well together. I have a coughing fit going on now as the weather changes and it is not fun and keeps sleeping hard. I hope you don't get sick.